Conduct the routing with appropriate Router Bit and Bushing Guide Ø30 mm with Universal Milling Frame and Routing Templates. Screw hinge door part (marked as "door") using 5mm Ø wood screws. via Plunge Router : Using Simonswerk's routing templates, prepare the leaf and frame using the appropriate router bits and 30mm bushing guide. Index-d can help provide the appropriate tools for your specific model. 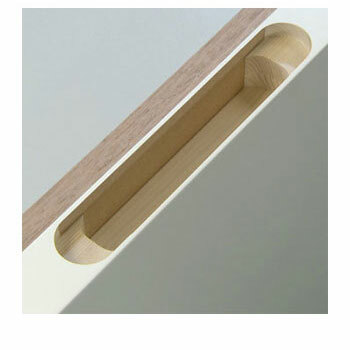 via Plunge Router : use the milling template documents (dxfs) supplied by Simonswerk to prepare the leaf and frame. Block Frame : Conduct routing according to Simonswerk routing data. Use Ø24mm Router Bit ( except with TE 240 3D, use Ø16mm ) and a Ø30mm Bushing Guide. Install hinge to the frame with enclosed wood screws. 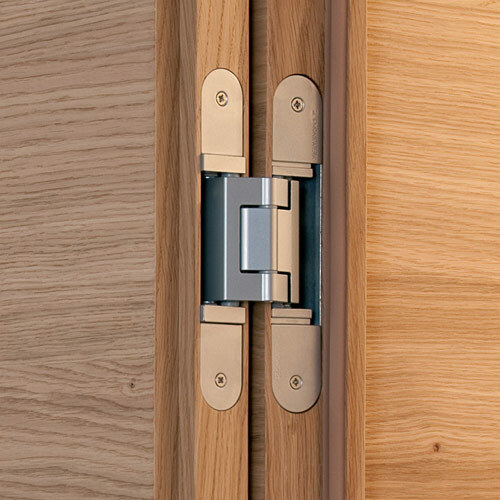 Casing Frame : To ensure a secure mounting, use the Simonswerk fixing plate required for each hinge. Mount the fixing plate by means of appropriate screws (not included) behind the casing. 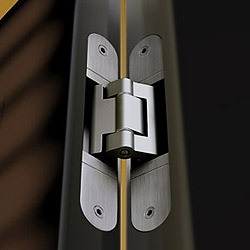 Install the hinge to the plate and frame by using the enclosed M5 screws. Steel Frame : After affixing the Simonswerk steel frame receiver to the inside of the frame, mount hinge by using the enclosed M5 screws. Fix cover plates by means of the enclosed screws. If you ever need to adjust the door again, simply take the covers off and use your hex key to get the door back into alignment. That's all there is to it.